This 3 nights package includes the first or the last night in Montreux. The choice is yours depending on your arrival and departure information. And then you stay 1 night in Lucerne or in Interlaken. Between these tourist destinations you will travel on the Golden Pass Line. On the ride on the Golden Pass Line you will see pre-alpine landscapes with rolling hills, beautiful mountains, valleys and meadows. 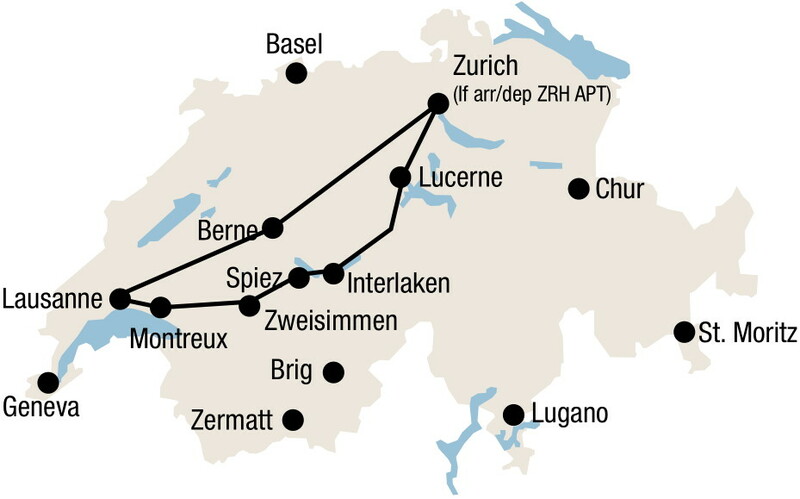 Starts and ends at any airport or city in Switzerland. Package includes all rail transportation, overnights in 3 or 4-star hotels with breakfast, and seat reservations on the Golden Pass Line from Lucerne to Interlaken and from Interlaken to Montreux. Runs all year around. From Lucerne over the Brünig Pass to Interlaken by the Luzern-Interlaken Express. On your journey you will pass 3 small lakes before reaching Lake Brienz with its very distinctive colour due to its glacial waters. From Interlaken you take the train to Zweisimmen and change to the Golden Pass Panoramic train to Montreux. You find yourself among alpine forests, bubbling mountain springs and picturesque mountain villages. Overnight in Montreux. Optional excursion with the Chocolate Train or optional visit to the Medieval Chillon Castle. Overnight in Montreux. From Interlaken take the train to Zweisimmen and change to the Golden Pass Panoramic train to Gstaad. Optional Excursion to Glacier 3000. From Gstaad you take a bus to the base station of the cable car which takes you to the top of Glacier 3000. After return by bus to Gstaad you continue your trip with the Golden Pass Panoramic train to Montreux. You find yourself among alpine forests, bubbling mountain springs and picturesque mountain villages. Overnight in Montreux. Swiss Transfer Ticket Combi: GoldenPassLine (3 transfers) in 2nd class from/to Swiss border or airport. 1 night in Lucerne or Interlaken, standard room with private facilities, breakfast. 2 nights in Montreux, standard room with private facilities, breakfast.